Boost your health with the Greens with Benefits Immunity Powder in Lemon and Ginger flavour. 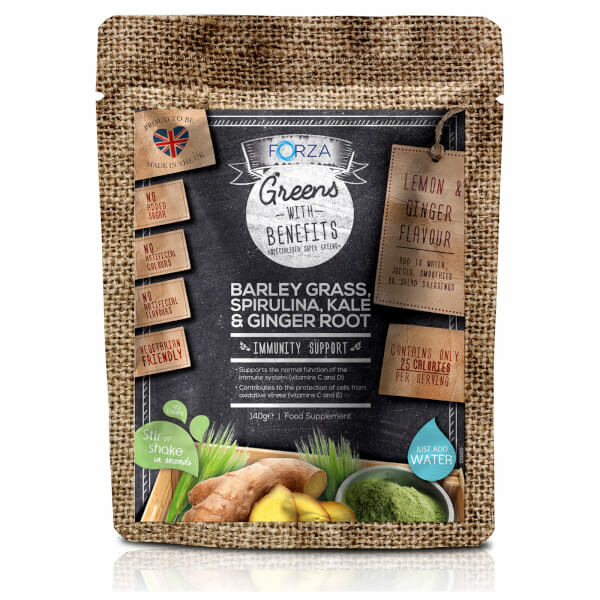 Brimming with antioxidants and vitamins, the refreshing shake supplement contains an expertly curated powerhouse blend of supergreens including Kale, Kelp, Spirulina, Green Tea, Chlorella and Ginger, with no added sugar and less than 25 calories per serving. Free from artificial flavours and colourings, the nourishing formula boasts a cocktail of vitamins, including C, D and E, which work in synergy to support the normal function of the immune system and help protect cells from oxidative stress. Simply add a couple of spoonfuls to smoothies, yoghurt, cereal, juices or just water to provide your body with the vital nutrients it needs to feel healthy, revitalised and invigorated. No added sugar. Free from artificial flavours and colourings. Vegan and Vegetarian friendly.